New to CDM Lacrosse - or need a fresher? Here a few of the most frequently asked questions. Q: My daughter played last season, why do I need to register again/every season? A: Registration is an opportunity to review emergency contacts, US lacrosse membership, and provide the Booster Board with accurate numbers so the appropriate funds are allocated to the season. Q: What does my registration donation pay for? A: Just about everything team related. 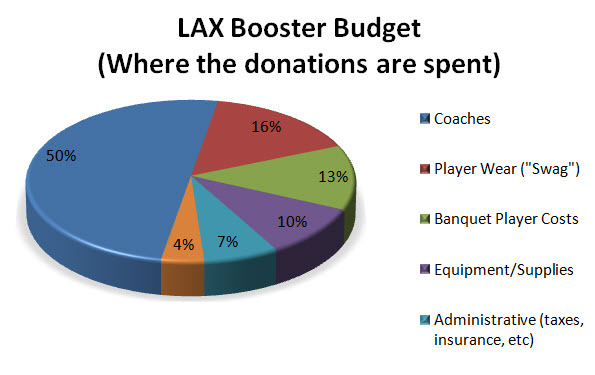 Without the boosters support through your generous fair share contributions, there would be no team as the school district only provides funding that would not be adequate to support hiring even one experienced coach for varsity for the season only. The suggested fair share donation amount of $850 per player determined by the total anticipated costs, most of which are fixed, divided by the expected numbers of players. We have a coaching staff of ten coaches for our three teams and are fortunate to have two coaches that are volunteers. Q: What is the difference between CDM LAX and Corona Wave? A: Corona Wave is not associated with CDM High School, but rather a team that plays during the off-season on the CDM Campus. The Corona Wave has no affiliation with the CDM HS Girls Lacrosse Team. The Corona Wave is open to any girls (9-12th grade) who wish to sharpen their lacrosse skills prior their high school season. Participation in or failure to participate in the Corona Wave program has no affect whatsoever in your ability to play on the CDM HS Girls Lacrosse team. The Corona Wave season practices will include fitness, weightlifting, and scrimmages. We will also participate in league scrimmages and the UCI Beach Break Away Tournament. Q: What uniform should be worn on game day? A: The standard: Beginning 2016 Season: Varsity and JV1: Carolina Blue for Home games; White for away games. Practice Team: White for Home games; Navy for away games. However, players should always bring both jerseys to all games. Q: How should the uniforms be laundered? A: Uniforms should be treated as “delicates” and washed in cold water on the delicate cycle and hung to dry. Q: Why do we have to turn the uniforms in at the end of the season? A: Uniforms are “re-used” for up to four years. This allows us to keep costs down. Q: Can my players name be embroidered on her uniform? A: No. uniforms cannot be altered. However, player's wear ("Swag wear") like fleece and windbreaker jackets, as well as backpacks can be embroidered. Q: Will bus transportation be provided to all away games? A: During the regular season, there will be bus transportation for the majority of away games. JV 1 & Practice Team may need to plan for their own transportation for some of their games, both on week day and weekend games. Q: Can my player take the bus one way and by personal vehicle the other? A: No. Players must take the bus both ways. Q: Will all teams take the same bus even if the games are at different times (but same venue)? A: Yes. Players should plan on some down time when sharing a bus. This down time is a perfect time to do homework and/or support their sister-team while modeling the team “swag” as it can cold in the evenings. Q: It’s my turn to volunteer for set-up. What does this mean? A: This means you will need to pick up the table, timer and score-board/flip chart from CDM. This needs to be coordinated with Ed Anthony, Field Set up and Equipment coordinator, (657) 203-1136 and picked up by the end of the school day. The set-up needs to be completed an hour before game time so that the ref has time to validate set up. Note: Field Set-up training is offered during the first couple of weeks of the season. More information will be provided at the Parent Info Night and via email. Q: It’s my turn to do the stats. What the heck does that mean? I’m new to the game and that sounds scary. Will someone be there to help me? A: Stats are kept on all the players through-out their high school LAX career. They are important to both coaches and the girls when it comes to college play and award season. We like to have 3 people at the stats table and at least one of them will be experienced. The time will also be kept by the Stats table volunteer. Note: Score keeping and Stats training is offered during the first couple of weeks of the season. More information will be provided at the Parent Info Night and via email. Q: Do we still need Stats volunteers for away games? A: Yes, but only 2 as the Home team will be required to keep the time. Q: How many Pop-up tents do we have and where are they stored? A: The CDM Girls Lacrosse team as one dedicated tent, however several smaller tents maybe in the CDM storage. Our tent is over-sized and quite heavy so it is recommended that a wagon or buddy system is used when transferring the tent from the CDM Equipment storage room to games/tourneys. Parents are encouraged to provide their personal tents as additional shade for the players and coaches. Q: How do the pop-up tents get from game to game? Usually it is up to a parent volunteer to transfer the tent(s). For bussed tournaments, there is usually room in one of the storage compartments on the bus. Note: The tent(s) must be retrieved from the CDM Equipment room during school hours. Do not plan on getting the tent during an evening or weekend as no one will be on campus to unlock the door for you. Q: Do we provide half-time snacks for the players? A: Nope. Players should plan accordingly. Q: I took some great photos during the game. How do I share them? Where can I upload them? A: We have a team site on SMUGMUG. Link and upload directions will be provided. Q: My player is going to miss a game (planned or unplanned). What is the best way to let the Coach know? A: If you know your player is going to miss a game or practice, let the coaches know as far in advance as possible. For unplanned absences such as illness, please text your Coach and Team mom. Q: It looks like rain. Do the girls still play in inclement weather? A: Sometimes. Light rain and muddy fields are part of the fun and the game will go on. However, if it is deemed unsafe playing conditions then the game can be delayed, rescheduled, or even canceled. Check the website or watch for emails from the coaches or team captains. Registration Questions - Shelli Black at or 949-500-8523.